I loved the friendship bond that Kevin Hart and the other main character had. I was extremely pleased with how the character Kevin Hart took care of his son and the son's mom after receiving income. The story line of the movie was outstanding. I enjoyed the entire movie. One of the best movie that I saw!!! Initially thought this would be a bit depressing... Not at all! Uplifting, funny, yes we laughed out loud and a joy! Pleasantly surprising. This film was terrific and a very funny situationally funny. Well casted. I have seen it twice. Attending a film a second time is my measure of a good movie! I was literally laughing out loud, which I never do. The chemistry between the characters is perfection. Great movie, very funny and sad too ! Great story. We need to have more movies like this ! I liked the fact that the wide differences between the two men gave them such a bond in the end. The humor was very good. I would see it again. Yawn...you will either love it or not, Enough said. Wonderful Love Story with Heartfelt Lessons. One of the best movies I have seen in years. You will not be disappointed. Kevin Hart's best performance! He should win an Oscar. Excellent story. Awesome acting. Hilarious! I wasn't expecting that. This film takes a little bit different turn than French version, which is better than this one, by the way, but this version still could be watched if no better options are available. All in all, a bit on the dull side. It was okay, I liked Cranston but the movie didn't grab you and I thought Kevin Hart overplayed his role...kind of boring really. Oh yuck!!! See the original - American remakes generally stink, and this one stunk. Funny, stomp your feet on the floor funny! Laughed so hard at times my face hurt! My husband and I have just come home from seeing The Upside... It was very well done. I had seen the original story and found this movie to be very true to the original story.... This story is based on a real event and is very well done. Both Kevin Hart and Bryan Cranston were outstanding. I was surprised at how well Nicole Kidman played her role.... Usually I find her a little hard to believe in her characters, but she is outstanding in this movie. We both loved the movie, funny & enjoyable. A very uplifting story. I would highly recommend this movie. Great movie and story. All of the actors did a great job! Good humor and drama. In a group of movie goers....I generally choose the movie, as it is a ladies outting, we all enjoyed it! Great entertainment. Funny, sweet. I am the movie chooser....took two of my friends, various ages of seniors, and they both enjoyed it, as did I, they enjoyed it thoroughly! Very enjoyable, I didn't know much about the movie, so I didn't have many expectations. It is a beautiful story, touching, funny, and a subect that could have been depressing, and yet, it was truly entertaining. A hit! So disappointed!! Loved the original and had hopes for this remake but it was so flat. What a wasted opportunity. Kevin Hart is no good. Funniest feel-good movie I've seen in years. Wonderful acting. Contrived and ultimately dull. May appeal to those easily entertained. 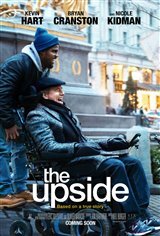 The Upside has all the elements of a heartwarming film and sometimes arranges them in compelling ways, but the film overall lacks warmth for its characters or passion for its plot. I wanted to like it, but I didn't.